Joint hypermobility indicates the presence of a genetic alteration of the collagen matrix of most tissues. These may distend giving sprains, subluxations, arthralgias (joint pains); may dilate, producing varicose veins, aneurisms, dysautonomia, cysts; may rupture, producing hernias; may wear and tear, giving early osteoarthritis and osteoporosis. HDCTs are diseases that can affect multiple organs and are due to alteration of the collagen (a ´protein) caused by a genetic mutation, that can be hereditary or due to a “the novo mutation”(new mutation). Alteration of Collagen 1 (COL1A or 2) gives OI. Problems with Collagen II (COL2A) produces cartilage diseases and dysplasia’s. Alteration of collagen III can give EDSH or VEDS (COL3A1 or 2). Disorders of Collagen V (COL5A1) produces EDS I-II. Alteration of Fibrillin or Elastine can cause MFS. ACCORDING TO THE 1997 VILLEFRANCHE REVISED NOSOLOGY"
A.- Ehlers – Danlos Syndrome (EDS). 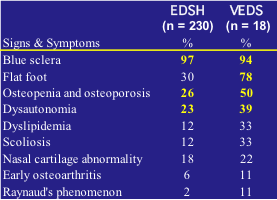 2.- Ehlers-Danlos Hypermobility Syndrome (EDSH). EDS type III or Joint Hypermobility Syndrome (JHS). Preferable should be called EDSH. It is one of the HDCT and is due to alteration of Collagen type III. The exact gene alteration is unknown, but it has been related to partial deficiency of Tenascin-X. It has Dominant Autosomic inheritance. It appears to be a forme fruste of the classic HDCT, since it has similar symptoms and signs of all of them, but with a lesser degree of severity. It is extremely frequent (40% of the Chilean population, as well as in the UK and probably in most countries if looked for), but usually not diagnosed. Frequent arthralgias, myalgias (at times similar to Fibromyalgia), recurrent tendinitis, bursitis, sprains, subluxations of joints, back pain, early osteoarthritis and early osteoporosis. Skin abnormalities, myopia, hernias, varicose veins, rectal prolapse, gastrointestinal reflux, inflammatory bowel disease, etc. Autonomic dysfunction: (Dysautonomia, Xeroftalmia and Xerostomia). The Beighton score (Bsc), has been used for more than 30 years. At present there is discussion which cut off point to use, usually 4/9 in adults and 3/9in children. The Brighton criteria (BC), includes de Bsc. 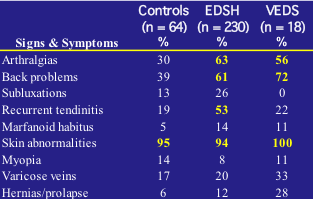 When the BC is positive is indicative of EDSH, unless there is an exclusion. Need to change the name of JHS. 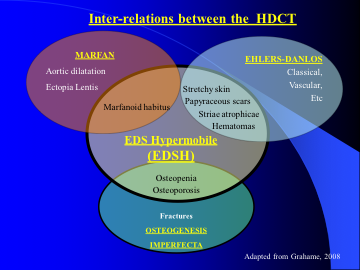 Hereditary Diseases of the Connective Tissues. Slide collection. Important Ehlers-Danlos Seminar on YOUTUBE, Claire Francomano MD. Maryland. USA. a) Biochemical confirmation. Fibroblast culture from a skin biopsy, followed by gel protein electrophoresis that detects abnormal molecules of the procollagen type III (DNA). Detects mutations in the sequence of the code. b) Diagnostic confirmation by Molecular Genetics. Detects abnormal collagen type III due to mutations of the gene COL 3A1, which is found in chromosome 2, locus 31 or 32. These tests have to be sent to specialized centers, such as Peter Byers MD, in Seattle, Washington. 4.- Kyphoscoliosis type EDS. Formerly EDS type VI. 5.-Arthrochalasia type EDS. Formerly included in EDS type VII (VII a). 6.-Dermatosparaxis type EDS. Formerly included in EDS type VII (VII b, c). MFS is another of the HDCTs, it is due to a genetic alteration of Fibrillin and Elastine. The altered gene is located in Chromosome 15 Locus 21. It is characterized by Marfanoid habitus with an arm span greater than the height. It is usually associated to dilatation or rupture of the aorta, Ectopia Lentis and Osteoporosis. Has Autosomic Dominant inheritance and affects 1 in about 12,000 people. OI is another of the HDCTs, it is due to an alteration of Collagen type I (COL1A or 2) and is characterized by blue sclerae and marked fracture tendency due to osteoporosis. Fractures can occur even in utero. It has usually Autosomic Dominant and occasionally Autosomic Recessive inheritance. Affects 1 in 20,000 born alive children and 1 in 100,000 adults. There are 5 types as noted in the “Sillence classification”.